I saw this tidbit somewhere not long ago (don't recall exactly where) and thought I'd share it simply because its the kind of thing that delights me. In the book of Job, we find in chapter 1 that this man for whom the book is named, was wealthy. Wealthy to the tune of 7000 sheep, 3000 camels, 500 yoke of oxen, and 500 hundred female donkeys (Job 1:3). Job was also blessed with 7 sons and 3 daughters (Job 1:2) Of course you remember the chain of events recorded in the book (if not, let this serve as a spoiler alert). Job loses everything, including not only his possessions but his health, ...and his children die. But if you skip to the end of the book, you will find that Job was blessed by God to receive double of all his former possessions (14000 sheep, 6000 camels, etc.- Job 42:12 )) plus another 7 sons and 3 daughters. (Job 42:13). So, the question then becomes, why double of everything else but only the same number of children as before his trials? And here is the whole point of this post. Job DID receive double the children, for the first 7 sons and 3 daughters did not perish, but only departed this earth before their father to be reunited with him in eternity! The Bible is full of gems like this that are so easy for us to overlook, but God continually blesses his people by sending faithful men to study and expound not only great foundational truths, but even the little nuggets of gold. No, I'm not talking about the "Sturgis" that is going on this week, ...I mean re-living the Sturgis that was. You know, the one that started it all. Face it, despite the fact that some of you will probably read this post the week after returning from "Sturgis", my money says that a number of you are like me and have come to regard "Sturgis" as just another over-crowded spectacle on the order of the Mall of America, or Disney World. Perhaps its my penchant for vintage motorcycles of the Knucklehead variety which led me to abandon the crowds of Sturgis. For those of you faithful who still make the sacred pilgrimage, there is good news coming in the form of Harley's new 2017 water cooled models, which should enable you to idle in "Sturgis" traffic to your hearts content. Despite my obvious apathy for what the annual Black Hills Motorcycle Classic has become, there is an upcoming event that sorely temps me to once again endure the seemingly endless miles of barren landscape that is South Dakota's Interstate 90. That event is "The Spirit of Sturgis Vintage Motorcycle Festival, to be held August 26-28 of this year. Lest we all forget, flat track racing is what started the whole phenomenon that we all now know as "Sturgis". What better way to honor that heritage than to take a trip back in time to races featuring the kind of bikes that made the event an annual gathering not to be missed. 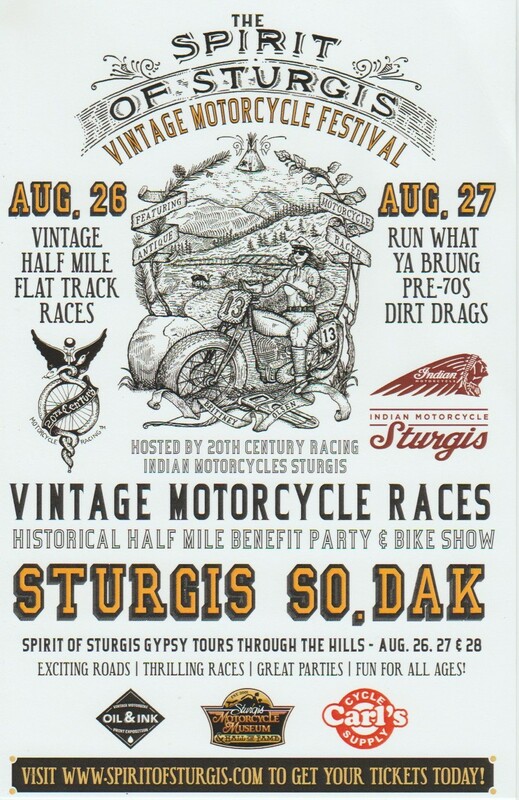 The Spirit of Sturgis Vintage Motorcycle Festival promises to give you a little taste of what it was like during the glory days of flat track racing, when Pappy Hoel and the Jackpine Gypsies hosted a race they dubbed the Black Hills Classic. Flat track racing; ya gotta love it! If you follow this blog, you may remember that I have been somewhat involved in the vintage flat track scene, if only to extent of providing porting work for local legend Bill Hofmeister's Iron Sportster powered XR as well as for Souix Falls vintage racer Clint Erickson. That alone is enough to make me want to attend, but I have to admit, the promise of "Pre '70s Dirt Drags" is what really caught my attention. In fact, I have to admit to spending time researching rear tires suitable for such an undertaking before coming to my senses and realizing that dirt drags and the open valve train of the Knuckledragger are probably not a good match. Future plans for The Spirit of Sturgis event include expanding into vintage asphalt drag racing as well. That would be near impossible for me to pass up. Nevertheless, I would like to point out a couple other incentives for you to make the trip to the inaugural Spirit of Sturgis Vintage Motorcycle Festival. One is the weather. Any one who has ever been to "Sturgis" during the first week of August will attest to the hot temperatures. The last week of August is much more likely to bring moderate temperatures with it. Another is massive crowds and traffic, or rather lack thereof. I already alluded to how much I would prefer to avoid them, so if Spirit of Sturgis had been scheduled to coincide with "Sturgis" ...well, no thanks. Finally, if the Spirit of Strugis takes off and grows, as it certainly has the potential to do, its always nice to "get in on the ground floor" so to speak. You might be able to not only re-live some history, but be a part of it!